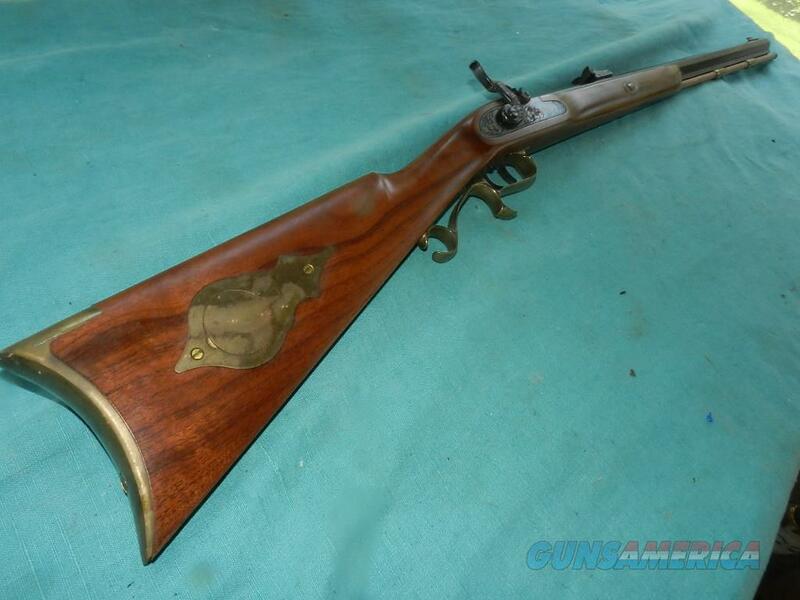 Description: Another excellant condition Thompson Center HAWKEN Muzzleloader in .50 cal. with a heavy octagonal 28" barrel.Rifled bore!!!! Metal on barrel is about 98% blue finish with some wear along the length . Has an brass trigger guard, and other furniture is brass including the patch box. The brown American walnut is in excellent condition, with good graining. Has wooden ramrod, with a brass tip. Has barrel address and .50cal... Strong case colors on the lock, works good. Adjustable rear sight.Good rifled bore.Check my inventory of rare grips, unusual gun parts, barrels and holsters. Shipping may be higher than stated as shippers raise their prices twice year without notice! When buying a gun always have it examined by a competent gunsmith before shooting. To buy a gun from me you must get a direct email for me, with details, and shipping cost. We don’t have a web site .I prefer money orders or a check. Item ships when funds come in. If you can only pay with a card let me know. I’m sorry I don’t list my phone number, did that for 30 days, never again.. I can’t talk on the phone all day…who will ship the guns? I’m just one person, and it’s very busy here! I do a brisk volume! I hope you like my wide selection of unusual guns, knives and gun parts. Shipping price determined by zip code. I try to keep the prices affordable, which means I make less money than most dealers. You won’t get altitude sickness with my prices! I consistently have the best selection of older guns If you attempt to buy, you must still contact us for details . A phone call won’t always secure a sale! Sometimes a local person can stop buy and purchase before the gun is removed. Not home many times. I can get six buys in an hour for the same gun this happens when guns are sold very reasonable! Best to send another email . Sometimes not home to get calls. Some guns are required shipment to a gun dealer near you for a transfer to you when it arrives. With the widest selection of older guns at great prices, We don’t have a store, and sell on the internet only. Thank You.